“The dream that united our nation” is the tagline to the new film being released this Independence Day based on the true events of India’s first hockey team. 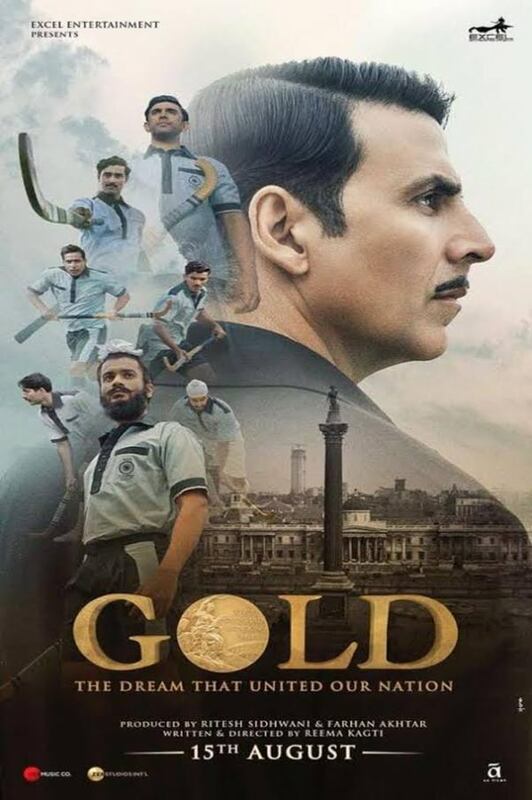 Gold follows Akshay Kumar as he leads India’s own first hockey team to their first gold medal in 1948. A powerful story about great players who stood up first under the banner of British Raj and then successfully took the gold medal at the Olympics for the first time as the Indian team. Under the production banner of Farhan Akhtar, Excel Entertainment, this inspiring movie will need not only an inspiring soundtrack but also as a period movie, stick to the sights and sounds of the age. As Akshay’s character is also Bengali, there will need to be a certain flavour of Kolkata added to the mix. Thus, Sachin Jigar will headline with additional work by Arko Pravo Mukherjee and Tanishk Bagchi to make up the in total 25 min soundtrack over 7 songs. The album starts with a beautiful and soft love song Naino Ne Baandhi. Sung by Yasser Desai under Arko’s direction it feels like classic tunes of the 90s where a boy would sing to girl while in the middle of the country on a bullock cart. Still as the character of Tapan Das is to be one of strength and power the lyrics also seem to add these to the song with lines like “Hum duniya se lad layenge, par tumhare bin nahin”. Just to stop it getting dull there is a decent change up in the middle a point in which it seems to get very personal, reaching into the listener’s heart to remind them of a first love. At the exact opposite end of the scale, comes the next song Chad Gayi Hai. As the title shows, this is about drinking and enjoying. Masti and hungama are a requirement here, after what must have been a heavy drinking session. There is a big band brass opening, Punjabi lyrics to bring out the bhangra, clapping and whistling from the crowd gathered around and finally a harmonium and drum which are the only likely instruments about for both the place and time. This is club music from the 1940s. We’ve had love, we’ve had drink, next to the serious business we are here for. Ghar Leyange Gold sung by Daler Mehndi is a classic of his style and voice of singing. Insistent beats, backing chorus, synth rhythms all saying we will win whatever happens. While this is certainly a good song for both a sporting film and a patriotic movie, it doesn’t seem in anyway attached to a date… the song could be being played in the 40s, the 80s or the 00s. The ending is a gradual speed increase driving up the heart rate to an echoing finish on “Gold”. Monobina is Tanishk’s addition to the album and is also its token Bengali song. In both parts it’s a bit of a surprise as its big band cabaret jazzy swing style is not something we’ve heard from Tanishk. The Bengali itself is restricted to a coda in the middle of the song, just enough to make us think this may be in some part set in Kolkata. The lyrics are a workable mix between Hindi and English with Yasser Desai singing only in Hindi, while Monali Thakur seems to stick mostly to English. If ‘Ghar Leyange Gold’ was the serious business, then Khel Khel Mein is how they get it done. KK is a strong singer over the top of electric bass and drums. There is a male chorus to back him up but his voice overrides all. There isn’t much in the lyrics, it’s just about the raw speed and clarity of the singer that gives this song any momentum. This feels like a montage song, something for showing off early tournament rounds or maybe even training runs. Of course, no album of power could do without Bollywood’s most powerful singer Sukhwinder Singh. Rasta Rasta is his moment in this album. This is classic Sukhwinder: his voice booming out above a dholak, banjo and acoustic guitar only put there to support him. The lyrics scream “don’t lose your bravery… charge ahead” and win the day. This is for the runners and the gym goers who will have already added it to their exercise playlist along with so many other Sukhwinder hits. But all these songs, whether powerful, inspirational or beautiful still do not give this film the flavour that is required for Independence Day. Independence Day movies always must leave audiences with a special feel, a mixture of pride and humility. Thus, we have Divya Kumar completing this album with Jaaga Hindustan. A classic hand-on-heart song to have cinemagoers standing up to think on with pride at being Indian and to remember with humility the sacrifices of those gone before. The lyrics themselves seem a bit jammed in but that is only to allow for an electric guitar with tuning for a classical accent, an acoustic guitar basically providing beat, tabla to bring verses to life and a long instrumental with which to finish the film. While this story is based on true events, it is a fictional telling of the trials of Tapan Das as he leads the first Indian men’s hockey team to gold at the Olympics. But for it to be an Independence Day film that’s not what is important. Gold must tell a heart-wrenching story for which cinemagoers must weep for their heroes and yet in the end know that each character was a winner in his or her own way. This brings pride and joy to the heart as the audience leaves the theatre. The music for such a film must do all the same things which is certainly what the music directors have strived for with this album. One love song, two party songs and four songs on message, on story. However, its not hard to feel that this album could have easily been shorter and a few of these songs shortened if not left out as they are both repetitive in themselves and when each other are considered. Also, there is nothing that really stands out in the album as the song of the film and it all seems to lack a bit of originality. 16 queries in 0.489 seconds.